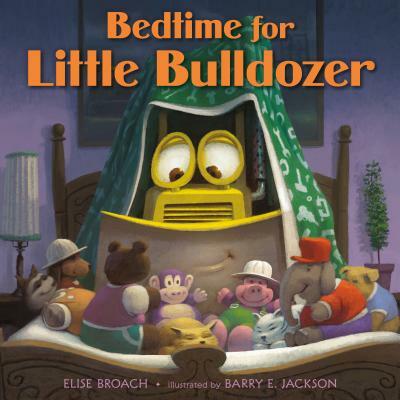 Little Bulldozer struggles to fall asleep in Bedtime for Little Bulldozer, a sweet and clever bedtime picture book by New York Times bestselling author Elise Broach with illustrations by Barry E. Jackson. Falling asleep isn’t always easy, especially for a loud and rumbling little bulldozer. Once he finally gets into bed, he can’t fall asleep no matter what he tries to do: has another drink of oil, gathers his favorite stuffies, and even reads his favorite book. Still, something’s not right, and only his sisters—a steamroller and a crane—can make it better. This reassuring and clever bedtime story is for young ones who need a bit of help “bull-dozing” off to sleep.